If you oversee document management, compliance policies, and collaboration channels, you know the level of productivity that can be achieved using workflows. In addition to the out-of-the-box workflows, SharePoint and Office 365 enable the creation of custom business workflows and a variety of no-code automation solutions. Many companies build these computing processes to help employees easily and duly perform repetitive tasks. But, many of these solutions are often either ignored or abandoned. There is a better approach to these initiatives. Since using any new workflow is about changing some working habits, it is crucial that you deploy a strategy that helps users get out of their habitual comfort zone and actually adopt your workflows, whether simple or complex. Just letting users know of the workflows availability will not suffice. You need a proven strategy and an effective tool to successfully drive everyone to start and continue using the repetitive chain of tasks. The common mistake made in these initiatives is that companies rely solely on trainers and support teams. There are 2 major problems with this approach: the aggregated cost of training sessions tend be too high and prohibitive for many companies; and, support from an IT team is not always instant. When training is not always easily accessible and support is often delayed, it is hard to get users to master and exploit the workflows. This common scenario is a recipe for discouragement; people will find it easier to fall back to the old ways of doing things. What if there was a way to automate both training and support? What if there was a tool that provides instant and exact help to the end-users every time and everywhere help is needed? 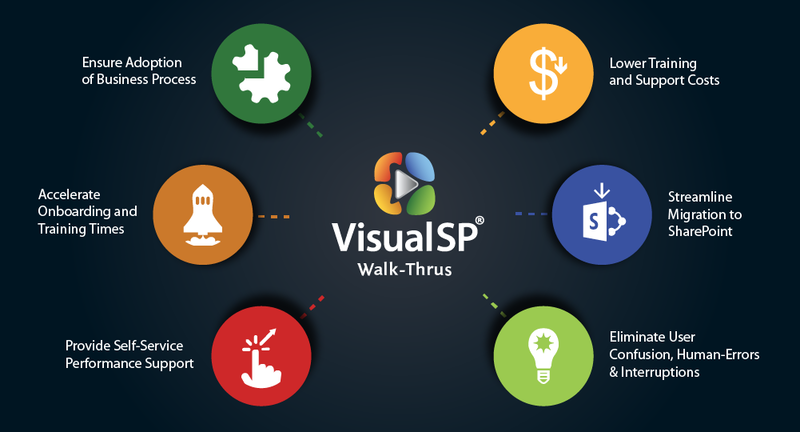 Thanks to our talented team of developers at VisualSP, there is such a way and there is such a tool: VisualSP is a context-sensitive help system for SharePoint and Office 365. The robust point and click interface within the help system allows you to create walk-thrus that guide end-users through every step of a workflow during the completion of tasks. As a plug and play, easy to install add-on application, VisualSP avails tutorials and help items within the interface of SharePoint and every application within the Office 365 suite. Once installed, a simple tab is visible on the screen and provides support on every feature that a user is currently using. Wherever a user goes within the platforms, a relevant and to-the-point short tutorial is available and viewable with a simple click on the tab. This eliminates the inconvenient task of searching for tutorials through folders and on the web. The need to request help from the IT support team is also reduced. Tutorials and help items include PDF tips sheets, annotated screenshots, screen-capture videos, and step-by-step walk-thrus. VisualSP helps you automate both training and support for end-users. Using the tool, anyone can easily create custom walk-thrus and provide end-users with always available and always relevant help instantly. When help is always a click away, the barriers to adopting workflows are dissolved. With such convenience, usage will organically grow. Also, the help system solution gives developers in your company more time to focus on developing new and better workflows and achieve optimal business results. Over 2 million users across over 200 companies are using VisualSP to drive adoption of business workflows, facilitate new employee on-boarding, reduce workloads on IT support teams, and attain all the major benefits driven by SharePoint and Office 365, including data security, collaboration, and productivity. To see how it works, request a free demo here.